Shaman is breathtaking. For a book that, in it’s most basic interpretation, is about a boy – or young man – growing up in the ice age of 32,000 years ago, following the daily, monthly, and yearly routines from hunting and fishing to shoring up for the winter, it is a compelling and epic piece of storytelling. A boy by our standards, a man by ancient standards, Loon is twelve at the beginning of the story, and we are introduced to him as he’s sent off by his pack, his family, on his Wander: two weeks alone on the land to fend for himself. He is stripped of everything he owns before being turned out in the cold and the next few days are dedicated not just to gathering together the things he needs to survive, but also evading the danger that constantly lurks outside the safety of camp – the cold, the animals, the Neanderthals. Through Loon’s travels we gradually learn the intricacies of ice-age living: family dynamics, pack dynamics, the turning of the seasons, the interaction of Homo sapiens with Neanderthals and with the animals and land they cohabit, the constant pressure to find food, the shaman’s role. It’s a strange and fascinating telling; a story that begins as a simple recanting of daily life, but which takes a turn in the middle as events converge and Loon and Thorn, chief shaman of Wolf pack, must make a life or death decision after Loon’s wife is stolen by a pack of ice-cold Northers. What will Loon do? How will his pack respond? Can Loon follow, and if he does, how will he get Elga back? From following the Northers’ tracks north, to a cold cold winter in the shadow of a giant ice shelf, this phase of Loon’s path to Shaman-hood culminates in a dramatic race for life across the tundra, down mountainsides, over raging rivers, and through forests, all the while pursued by howling wolves, angry men and the pangs of hunger while Loon fights with injuries old and new, Thorn with instinct to protect his pack versus the instinct to do right by the spirits. The decisions made here will change everything forever, as his wander changed everything forever, as his marriage changed everything forever. I am forever fascinated by the lines between science fiction and fiction – why is one author classed as sci-fi while another isn’t? Where does the distinction lie? 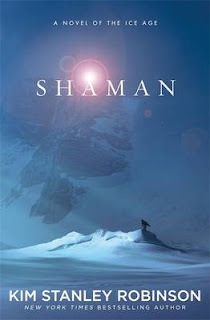 Kim Stanley Robinson writes the kind of literary books that should be placed alongside ‘mainstream’ authors such as Margaret Atwood, George Orwell, J G Ballard – and Shaman is no exception. Atwood traditionally refers to her more sci-fi-esque fiction as ‘speculative’ rather than sci-fi, which is a very apt description, and this is absolutely the category to which I think Kim Stanley Robinson’s work most closely matches. I found myself biting back tears in several places. Who were these people really? How much is Robinson’s writing based on imagination, how much on research? Do these exact paintings exist? Shaman is not the first time that an author has recreated ancient times – Jean Auel and Michelle Paver come first to mind – but it still feels unusual and fresh for a science fiction author to turn his powers of world-building away from the future and into the past. Robinson is visionary in the way he builds this world and these characters, from the cold winters to hungry springs to summer eight eight festivals, the snow and the wind, the caribou hunt, the impenetrable blackness of the caves where they paint. This is a tale of life on the edge, life in the extreme, and it’s beautiful. KSR has mentioned in a few interviews that the paintings in the book were directly inspired by the discoveries in the Chauvet cave in France; I can't recommend the Werner Herzog film, Cave of Forgotten Dreams, enough.